Foley has been with Premier for three years and is very excited about being involved in the forward-thinking company, he says. According to Foley, the technology that has been developed in Holland is more efficient than what has been historically used in the U.S., and allows the company to support sustainable farming with a closed-loop system. Another way Premier’s method is friendly to the environment as well as more efficient has to do with the recycling of all of the company’s waste products. Also, utilizing recycled products from elsewhere helps make up the ingredients used in the compost, according to Foley. The farm grows, packs and distributes to local retail and food service markets in California—primarily Sacramento, San Francisco and LA areas. The reasons for holding fast to sustainable farming are multifold, according to Foley. Premier Mushrooms also runs an annual river clean-up event in partnership with local businesses and non-profits. “We were interested in tying in with the local community in helping the environment,” he says. “We decided to have a river cleanup project on the Sacramento River. As it turned out, it just happened to coincide with California’s Annual Cleanup Day—it’s actually an international event, called Coastal Cleanup Day. 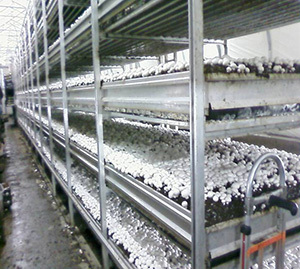 Next year, Premier Mushrooms hopes to apply for a Zero Waste Certificate, offered through the United States Zero Waste Business Council.